In the spring of 2015, I spent an evening at a pond watching American Toads sing, wrestle and mate. Over the course of a few days, hundreds of toads visited this pond. 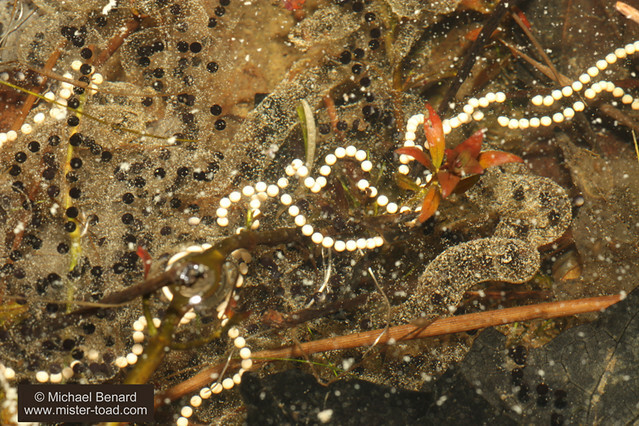 American Toads lay long strings of thousands of eggs that are quite distinct from the single eggs or clusters of eggs laid by amphibians like wood frogs, spring peepers, and ambystomatid salamanders. Why were these eggs white? My guess is that the mother toad was albino or leucistic. There are many examples of albino female frogs laying white eggs. Unfortunately I did not see the adults who laid these eggs, so I don't know for sure if the mother was albino. But that seems to be the most likely explanation. But what happens as the embryos develop? Will they ultimately grow into albino frogs? 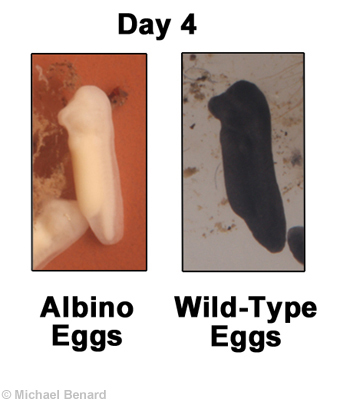 Over the first four days of development, the all-black ("wild type") eggs maintained their black color. And the all-white, presumably albino, eggs also maintained their white color. On day four, the toads started hatching from the eggs. By day six, just two days after hatching, the formerly all-white hatchlings had started to develop black pigment. The all-black hatchlings maintained their color. 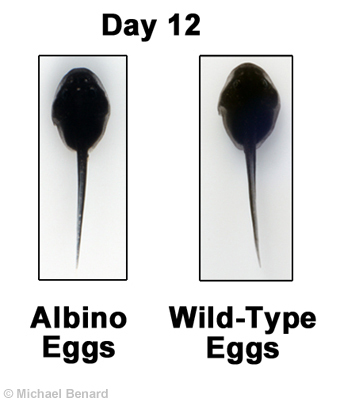 By day 12, the tadpoles from the white eggs were indistinguishable from the tadpoles from the black eggs. .
Albinism in frogs is frequently caused by a mutation in one of the genes involved in the development of skin pigment. These albino mutants are recessive, so that individuals that carry one mutant copy and one wild-type copy are able to produce the typical skin pigment. But individuals that have two copies of the recessive allele cannot produce skin pigment during development. Biologists were able to demonstrate that many cases of amphibian albinism were due to recessive alleles by breeding different combinations of albino and wild-type adults. For example, Sandra Smith-Gill and colleagues demonstrated that crossing male albino leopard frogs with female albino leopard frogs always produced albino offspring. When they crossed albinos with wild-type frogs, all of the resulting offspring had the wild-type coloration. 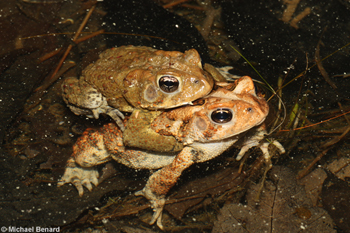 Similar crosses have been conducting in other amphibians, like western chorus frogs, demonstrating that albinism in other species is often a recessive trait. 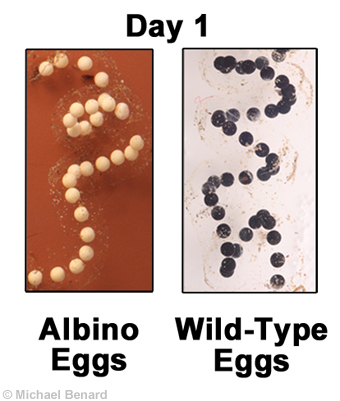 These experiments give us a suggestion for why the initially white toad eggs developed into normal black tadpoles. If their mother had two copies of the recessive albino allele, she would not have been able to produce the black pigment found in normal eggs. As a consequence, the eggs she produced would be all white. But then if she mated with a normally-pigmented male toad, their offspring would have one albino allele and one wild-type allele. 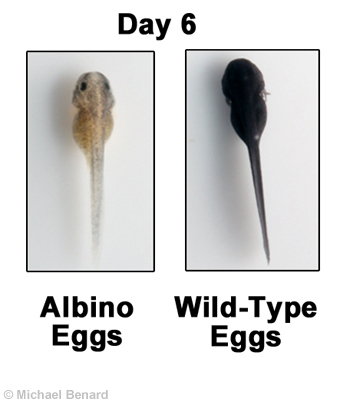 As the eggs developed into tadpoles, the wild-type alleles from the father would start producing dark pigment, and the toads would eventually develop the normal pigmentation.